General settings: These settings aim at defining regular expressions used to identify Oracle Forms requests and responses. 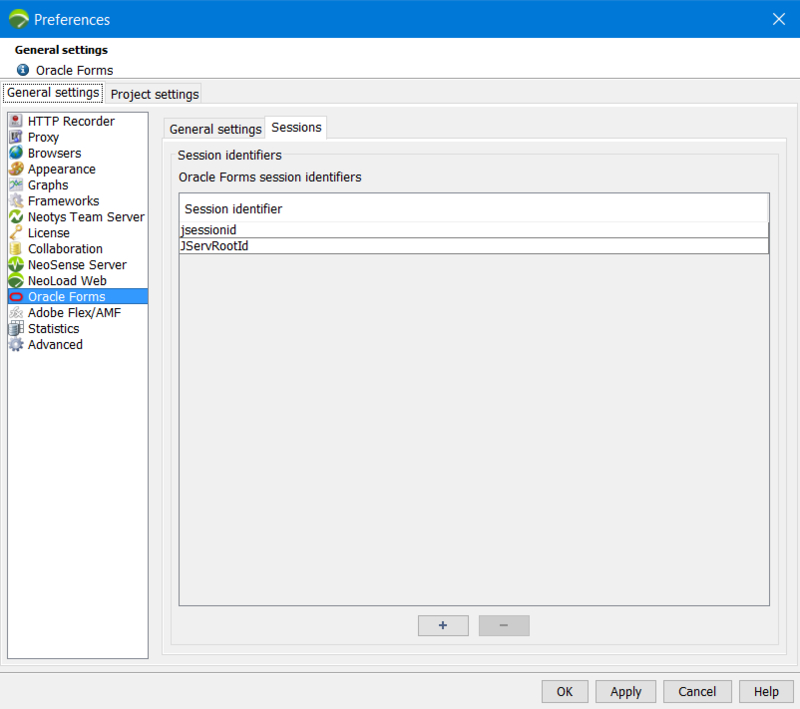 Sessions: These settings aim at defining session identifiers used by NeoLoad to differentiate concurrent Oracle Forms applets (for example, running several Oracle Forms applets within one page). The regular expression that identifies the Content-type header in Oracle Forms requests and responses. 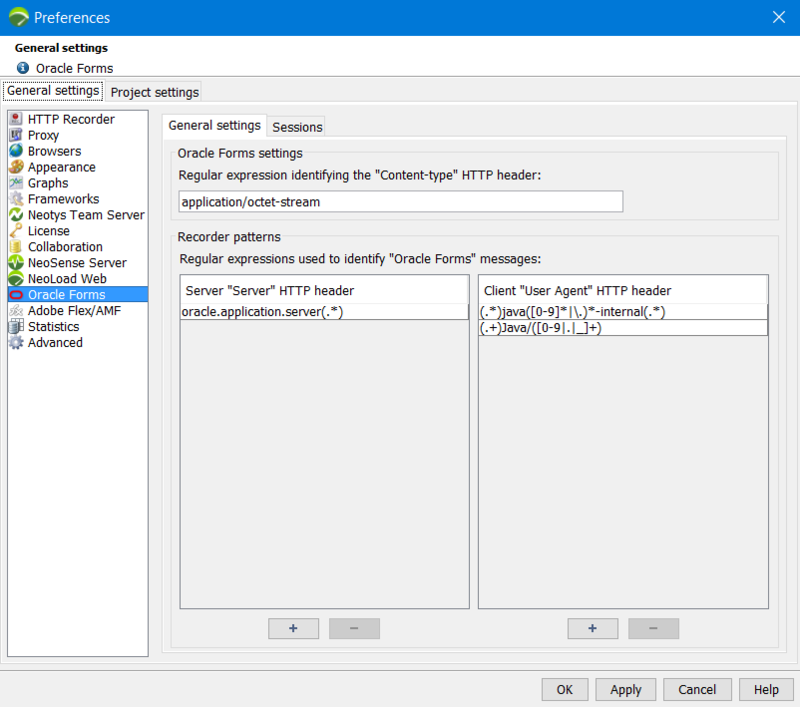 In most cases, Oracle Forms requests and responses are sent in binary format; therefore, the Content-type header value is generally application/octet-stream. The regular expressions that identify the User-agent and Server HTTP headers. In NeoLoad, several values may be defined for each HTTP header. The Content-type HTTP header in the request and response matches the given regular expression. The User-agent HTTP header matches at least one of the given regular expressions. The Server HTTP header matches at least one of the given regular expressions. Care should be taken in modifying these settings. Any incorrect configuration can cause NeoLoad to wrongly identify Oracle Forms requests. All these settings have pre-configured default values that allow the recording of Oracle Forms requests using an Oracle Forms 9i or 10g application server. In order to differentiate between Oracle Forms applets executing simultaneously in a same web page (or simultaneously in different browser tabs), NeoLoad needs a unique identifier for each Oracle Forms session: the session identifier. NeoLoad is able to look for session identifiers in applet URL requests. For example, if the Oracle Forms applet sends a request to http://myserver:8889/forms/servlet;jsessionid=... the session identifier is jsessionid. When NeoLoad tries to find this session identifier in the Oracle Forms request URL, the search process is case insensitive: JsessionId or JSESSIONID gives the same result as jsessionid. Session settings are preconfigured for Oracle Forms 9i and 10g application servers.